» SEPA: PHILA PD SGT TIMOTHY SIMPSON: END OF WATCH Warriors' Watch Riders: WE HAVE YOUR BACKS AT HOME! The rain held off, the skies were semi-clear and somewhere in the neighborhood of 200 to 225 bikes appeared from numerous directions and several rally points to gather once again to honor the passing of yet another Philadelphia Police Officer, Sgt. Timothy Simpson. It is a sad fact that we’ve had to do this so many times of late that we’ve become quite practiced at it. Although I was charged with the RC duties for this mission I had very little to do as several of our members stepped up to handle comms while my computer was down, organizing secondary rally points for incoming riders and securing the rally point. T and Shooter…..muchos gracias for the phone calls and aid with posting on the site when I was unable to do so. Special kudos to Kel for having the rally point set up and a plan in place for parking and staging of motorcycles and cages. Bobcat, DJolly and Huggy handled traffic direction and staging area parking, Shooter and Al “Deuce” from Delaware providing escorts from the staging area out to the line. Although we were unable to come up with numbers that we would like to have seen we still were able to provide a substantial presence along the final procession route. After staging and conducting a short briefing (Kel has a big enough mouth, apparently that we did not miss having a bull horn!!) a briefing which I must note was roundly ignored by a number of participants, we began, under the guidance and assistance of the Bensalem Twp. Police Dept. (way to go, Lengua, SPOCforLEO) to move out in small groups of 6 to 10 and began to line the roadside. We were in position and had the last 1\2 mile of the route blanketed and covered with bikes and our flag lines were set. I’m hopeful that we were able to provide some level of comfort for Sgt. Simpson’s family, friends and colleagues as we were the last group they saw before entering the cemetery grounds. Numerous police officers throughout the procession made eye contact with many of us and expressed their appreciation for our presence. Once again I had the honor and the pleasure to stand side by side with a group of fellow patriots and the “no longer silent” majority to help to send a message to those who would do our protectors harm that the police ARE NOT ALONE. We, the members of the Warriors Watch Riders have their backs and we will do whatever is asked of us to contine to send that message. Thank you, from the bottom of my heart, each and every one for honoring me by allowing me to “lead” on this effort. It is beyond my ability to convey to you how much this day meant to me. God bless you all and God bless our Country and its defenders. 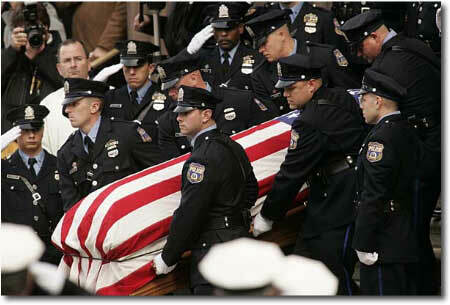 No user commented in " SEPA: PHILA PD SGT TIMOTHY SIMPSON: END OF WATCH "